Hundreds of Tsumego Go Problems with answers. 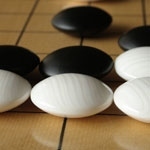 Thousands of free Go problems (tsumego) to study. More than 7000 well organized life-and-death, joseki, fuseki, endgame, etc. problems for you to solve, and you can contribute your own stumpers. Uses java.